“You can easily purchase high-performance welding automation “turnkey” without needing in-house welding expertise, because the integrator is “the expert”.” Really? That’s a familiar idea. But is it true, or… is it just a manufacturing management myth? Chances of success? Probably less than 10%. That’s how you purchase poor to mediocre welding automation performance, like most of your competition has, which usually produces small profit margins. Is that the solution that will REALLY help you survive and get stronger? If it’s seemed like every launch is a new Vegas gambling junket, you may not be far from the truth: 10% odds on bringing home a profit doesn’t sound very appealing. Still want to try it again? 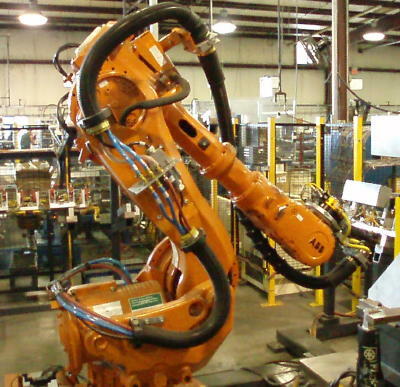 Three Foundational Welding Automation Principles. The Two Successful Paths to achieving high-performance welding automation. Three classic reasons that welding integration suppliers can rarely deliver world-class “turnkey” welding automation results. Five suggestions on how to pick an excellent welding automation designer/integrator and achieve great results. You buy or create automation for two basic reasons: to improve profit & quality, or because a customer demands it of you for those very reasons. So why not be hugely successful at it? Why not say goodbye to painful, lame launch results? Why not aspire to be so successful in manufacturing automation, that you trounce your competitors? Why shouldn’t one of your biggest challenges be developing strategies to hide how profitable your welding operations are from your nosy customers and envious competitors? To be most successful in welding automation, the first two questions to ask are “what is our path to the best long-term profits, and what will it take to get us there?” Because I have repeatedly achieved that in complex welding automation, and created cultures of effective Continuous Improvement, I have some solid answers for those questions. But to explain, I need to build the foundational principles – because they are invisible on the radar screen of most company management. First, let’s realize a simple point: whatever the Pepsi machine says in the display window is how much it costs to get a bottle or can out of the machine. If the goal is high-profitability, high-quality welding automation that gives you a competitive advantage, then there are some coins required to get there. Don’t dare think you can save money by cutting critical “options” from the purchase order: that’s like watching a manager beating on the $1 Pepsi machine and demanding a drink for their customer when they only put in 75 cents. Don’t create such embarrassment… decide upfront to pay the price for success. Instead of looking for ways to cheat the cost of success, which creates a high risk of project failure or tiny profits, look for low-cost opportunities to innovate and make the automation even more profitable than the proposal said it would be. “What is expected of a welding inverter” in order to be able to interact with a robot? Common, logical questions for a welding equipment marketing guy, right? In a recent robotic welding group forum, Mr. Chinoy, the marketing manager of a welding equipment company, also asked “what parameters are required to integrate GMAW (MIG) equipment to the robot control panel”, besides wire feed speed and voltage? I answered those. And yet, hidden under the tip of that question like the 90% of an underwater iceberg, is the real question of ship-sinking power: what welding system interfacing and content will really earn the respect and repeat business of an end-user customer? Let’s do something stunning, and talk about that far bigger question too! The answers depend on both your target business segment, and your company’s long-term goals as a welding equipment manufacturer. Many welding equipment companies design and launch a new machine every 3 years. They just answer the obvious visible/functional questions. One company chose to put out a pulse-MIG inverter that has been in continuous production for over 20 yrs, and has been the “king” not only of Electric Boat but the Korean shipyards for over a decade. In fact, older system versions can typically be upgraded to latest performance or customized waveform combinations with a simple plug-in EPROM chip swapout. Why such content & success with the Digipulse (Automatic) system? Simple – they answered the big hidden questions, and applied the hard yet hidden expertise required in order to faithfully serve the arc physics as well as the customer’s real needs and desires. How could they design that content back when welding robots were nearly non-existent? Because “hard-tooled” PLC-interfaced welding automation has essentially the same basic performance and interfacing needs as a robot. That can be shown by taking the unusual step of putting a robotic MIG process “fishbone” diagram together. 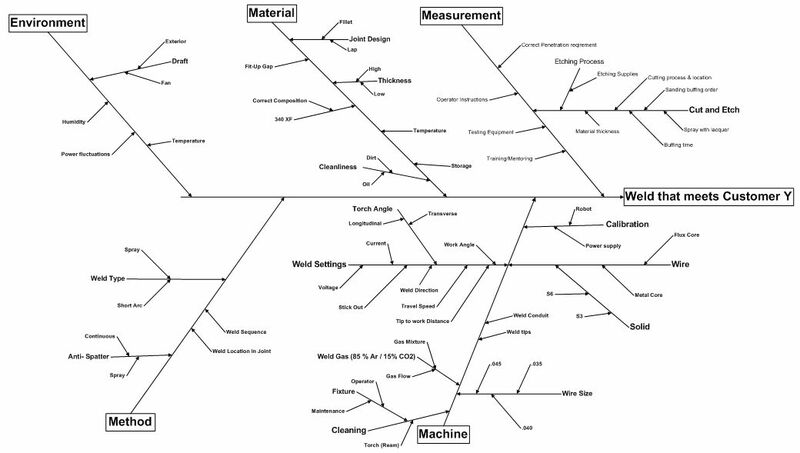 I’ve put a GMAW fishbone below (a W.E./SSBB project collaboration). It’s still hard to read when you click on it, and it doesn’t touch on the welding system design or integration content. But, it does show the overall process complexity and provides a starting point to consider welding system design and integration needs in order to consistently deliver perfect weld quality. Take arc-starting and arc-established signals, for example. A manual welder is going to automatically compensate for an occasional poor arc-start. It doesn’t matter. But consider the dramatic difference in welding automation: when the torch travel in automation must rely on a signal to begin, aren’t the quality and cost implications much more dramatic and far-reaching than what most welding equipment manufacturers have been prepared to admit? This is only one piece of the automation puzzle, but it’s both critical and badly neglected. The common minimalist approach is to provide a feedback signal during active welding, a “system ready” signal, an error output signal to indicate the system is in a fault state and unable to weld, and maybe a system-reset input. Many welding systems just provide those minimums, as “add-on” content to enable manual welding systems to go on a robot.